Many charities and social enterprises are not receiving the support they need to become investment-ready, according to a report published yesterday by the Big Lottery Fund. Investment Readiness in the UK, written by New Philanthropy Capital and ClearlySo on behalf of the BLF, says that advice and support are major factors in securing finance. The findings are based on 1,255 responses from a survey of 7,420 organisations that had received grants from the BLF or who were members of ClearlySo, which finds investment for social ventures. More than 70 per cent of respondents were charities. The report says that only 42 per cent of organisations that were successful in securing funding had managed to access advice and support. And only 23 per cent of organisations that had tried but failed to secure funding had managed to do so. The report says this suggests both that advice and support are hard to come by and that they are a major factor in successfully securing finance. The report says: "Whilst we cannot categorically state that external support leads to a greater chance of securing investment, almost twice as many of those surveyed that had secured investment had received external support, compared to those that did not. This reinforces the rationale to provide well-designed support to those for whom social investment could be beneficial." Of those surveyed, 21 per cent had successfully accessed social investment, 7 per cent had tried but had not yet been successful, 8 per cent had not yet tried and 43 per cent were not interested in looking for it. The report says investors and investees disagreed about what support was needed, and that the types of support available did not meet perceived needs. It says organisations do not know where to find support. 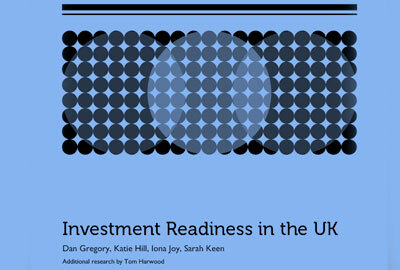 "Those at early stages of interest in social investment are looking for step-by-step guides," the report says. "Signposting is poorly coordinated and there are many gaps in provision, which is mixed and patchy across the UK. Organisations are often not ‘near to ready’ when seeking finance, showing the need to develop more efficient filtering systems." The report recommends developing generic support for organisations at an early stage, with more complex and bespoke support later on. "Generic support may be more suitable, particularly for the earlier stages of investment preparedness," it says. "More costly and time-consuming tailored support is then reserved for organisations that have advanced beyond early stages of preparation and seek to tackle more specific and/or complex needs." According to the report charities are mostly interested in long-term investment to help them scale up existing activities, with investors taking a relatively high level of risk. It says that many organisations are interested in seeking equity or quasi-equity investments, where the repayments to the investor are based on the success of the organisation. However, most investment in the sector is in the form of asset-backed loans. The report says 21 per cent of respondents had successfully secured investment, but the main source of finance was secured loans from mainstream providers. Lack of financial acumen and strength of revenue model are identified as major weaknesses by investors, but social sector organisations are significantly more confident about their abilities. The report says that the sector needs to develop skills to measure social impact for payment-by-results contracts.